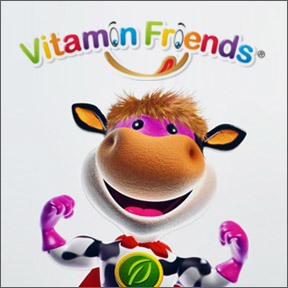 Professional Supplement Center now carries Vitamin Friends, a line of all natural, vegetarian chewable supplements formulated specifically for children. The line includes multivitamins, calcium, Vitamin D3, omega-3’s, immune and appetite support, as well as pre-and probiotic formulations. Designed for efficacy and absorption, and manufactured with high quality ingredients, Vitamin Friends gummie vitamins are gelatin free so they won’t stick to children’s teeth. All products are formulated to be gluten, nut, and dairy free with no artificial colors, flavors, or sweeteners. Mega Multi Vitamin Cherry Orange Pectin Gummies – This complete multivitamin and mineral proprietary formula is designed to support healthy growth and development, as well as promote enhanced concentration, restful sleep and healthy immune function. Gluten, nut, and dairy free, Non-GMO vegetarian formulation. ProbaYo Acidophilus & Prebiotic Vanilla Yogurt – One gummy bear provides 400 million live active cultures along with FOS, a microbiota supportive pre-biotic, in support of a healthy digestive system and a healthy immune response. Gluten, nut, and dairy free, vegetarian kosher formulation. Propolis & Echinacea Berry Pectin – This immune supportive blend of echinacea and propolis, a vitamin and mineral rich natural bee product, is designed to support the body’s natural resistance, as well as protect against cell-damaging free radicals. Non-GMO, vegetarian, kosher formulation. YoMega Fax Seed Sugar Fee Tangerine Yogurt – This product supplies plant-based Omega-3, 6 and 9 In support of healthy brain development and visual function. Gluten, nut, and dairy free, vegetarian kosher formulation. Boost Appetite Orange Pectin Gummies – This proprietary formula naturally supports a healthy appetite, as well as energy production and immune system maintenance. Ingredients include citron, sage, cinnamon, honey, lemon and vitamin C. Gluten, wheat, dairy, soy and nut free, Non-GMO vegetarian formulation. DiYo Vitamin D-3 Banana Yogurt – This product supplies highly absorbable vitamin D3 along with calcium in support of immune health, healthy teeth, and the building and maintenance of a healthy skeletal system. Gluten, nut and dairy free, vegetarian kosher formulation. This entry was posted in Home and tagged Boost Appetite Orange Pectin Gummies, DiYo Vitamin D-3 Banana Yogurt, Mega Multi Vitamin Cherry Orange Pectin Gummies, ProbaYo Acidophilus & Prebiotic Vanilla Yogurt, Propolis & Echinacea Berry Pectin, Vitamin Friends - Featured Brand, YoMega Fax Seed Sugar Fee Tangerine Yogurt. Bookmark the permalink.